The Fukushima-Daiichi nuclear power plant meltdown in Japan exactly 5 years ago on March 11, 2011 brought to light the risks to human and environmental healthwhich come from our dependence on nuclear energy. Nearly 20,000 people lost their lives and more than 230,000 lost their homes in the triple disaster, and the long-term effects of the radiation from the power plant meltdown will continue to be studied for decades. The US has been fortunate to avoid a significant nuclear catastrophe since the Three Mile Island meltdown in 1979 – which cost over $1 billion and 13 years to clean up. But our ageing nuclear power plants are in need of repair, and the country still has no long-term plan for managing radioactive waste and spent fuel rods. Just this week in Florida a study revealed that the Turkey Point power plant has been leaking radioactive water into the nearby Biscayne Bay as a result of the decrepit cooling canal system, and will likely require the plant to be closed or new cooling towers to be constructed. This is only an example of the challenges facing our nuclear power plants. While nuclear reactors continue to power homes and businesses across the nation, the discussion about what to do with radioactive waste and spent fuel has gone to the grave, buried with the infamous $100 billion Yucca Mountain Repository. America’s ageing nuclear power plants hold over 70,000 metric tons of radioactive waste. While the Yucca Mountain Repository is almost certain to never receive any nuclear waste, it must go somewhere! And for now, that ‘somewhere’ is in a wet or dry storage facility at the nuclear power plant near you (see map below). President Obama organized and commissioned a study from the 2012 Commission on America’s Nuclear Future. The Commission developed a set of policy initiatives which would, among other things: allow for new sites for storage and disposal (beyond the one currently allowed by law – Yucca Mountain); enable construction of new interim storage facilities; and improve transportation of waste across states and municipalities. What are your thoughts on this proposal? The Yucca Mountain project remains stalled while over 70,000 metric tons of nuclear waste sit in waiting at over 75 nuclear power plants in 33 states around the country (the Government Accountability Office estimate the volume of waste would fill a football field 17 meters deep). Since a 2013 US Court of Appeals ruling in favor of the National Association of Regulatory Utility Commissioners and Nuclear Energy Institute, nuclear utilities are not required to make payments to the nuclear waste recovery fund until the DOE follows the Nuclear Waste Policy Act (NWPA) requirements to use Yucca Mountain, or the law is changed by Congress. With the DOE’s failure to take in the spent fuel starting in 1998 as agreed, over 80 lawsuits have been filed to recover claimed damages. The lawsuits alone may cost taxpayers about $20 billion by 2020, and will continue at the rate of about $500 million per year after this until a solution is implemented. A new consent-based process for selecting and evaluating new sites and licensing new consolidated storage and disposal facilities (revision of the expired Nuclear Waste Negotiator provisions of the NWPA). Due to a 1987 amendment, the NWPA allows for only a single repository site at Yucca Mountain. Improved public information, safety equipment and other broad assistance for waste-related transportation safety programs in municipalities, states and tribes whose jurisdiction is traversed by shipments of nuclear waste. A new, independent federal waste management organization and oversight/regulation mechanisms to manage spent nuclear fuel and high-level radioactive waste (currently conducted by the DOE). Stable funding – the funds generated through waste recovery payments and federal budget allocations to the Nuclear Waste Fund should be accessible independent of Congress’ annual appropriations but subject to rigorous financial and managerial oversight. The Nuclear Waste Fund has upwards of $20 billion as of 2015 – funds which are not available for use until a resolution is determined. Some residents from Bloomfield CT and surrounding towns which make up the Metropolitan District Commission are opposing the construction and operation of a new 443,000 square foot Niagara Bottling Plant which will process up to 450,000 gallons of water daily on its first line (and up to 1.8 million gallons per day if it expands to the maximum of 4 lines). Bloomfield began negotiations with the company in 2013-14, however Niagara instead tried to build the new plant in Ulster, N.Y. but were unable to secure tax breaks and avail community concerns, and eventually returned to Bloomfield to work out a deal in December 2015. Residents have expressed concern over the Niagara bottling plant itself, and also have raised objection to the process by which the Town negotiated the deal and offered tax abatements without public participation. State Senator Beth Bye introduced legislation, S.B. 328, which could enable public notification before the local governing bodies approve a tax abatement, a change which might prove to be an effective method for facilitating communication and transparency in town planning. In the current draft the towns may, by ordinance, disclose this information, however the bill does not currently require disclosure (and without an enforcement requirement, no change would be likely to occur). Vote here! Senator Bye and Rep. David Baram also introduced legislation, S.B. 422, to cancel the water and sewer rate discounts that Niagara (and other water bottling businesses) could receive. Eliminating the ability for public water utilities to discount water and sewer rates for water bottling users could negatively impact existing and future businesses in the State, and has generated some objection from other lawmakers and business developers. You can vote on this piece of legislation here! The Bloomfield Town Council has presented its own plan aligned with the citizens’ demand to improve communication through: an expanded email list of the town council agendas, automated distribution of agendas to all commissions and committees, public hearings and newspaper notices for tax abatement applications, disclosure of the developer on any applications for zoning, wetlands or abatements, and quarterly reports from the MDC. Let the Town Council know how you feel about this proposal! Bloomfield Town Manager Philip Schenck cited that the agreement includes 100% tax abatement on the building for the first three years, followed by a decreasing rate (85-85-80-50) over the next four years. The company will pay about $440,000 in building permits, as well as physical asset taxes and property taxes on the 42-acre lot (valued between $1-2 million). The discount would save Niagara about $300,000 a year on water costs and about $1.8 million on sewer costs at maximum usage, according to MDC CEO Scott Jellison. The MDC meanwhile would realize about $3.8 million in additional revenue annually. The plant will cost the company about $73 million to construct. The Metropolitan District Commission contends that the plant will not endanger the supply, noting a surplus in capacity. MDC Board of Commissioners Chair William DiBella noted that they are bound by the legislature to provide the water to law-abiding customers regardless of the intended use, and that higher industrial water use can lower water bills for residential customers (they approximate an average $30 household savings by 2020). To challenge the construction of the plant, critics note the environmental damage of the plastic bottle industry, and question the value of the approximately 38 jobs which the company has planned to provide. Several ad-hoc organizations have risen to the occasion to challenge the new plant, including theBloomfield Citizens group. State Senator Beth Bye, who represents Bloomfield, Burlington, Farmington and West Hartford, stated plans to introduce legislation to reduce plant operations during water shortfalls, identify the ‘real value’ of being sold to private companies, and prevent private discounts on water improved with public funds. Though the construction of the plant seems all-but-inevitable at this point, with the negotiations and permitting complete, it is important to question if the benefits of the bottling plant outweigh the cost to the community? Given that the plant’s construction will likely proceed despite some recent public dissent, it is perhaps more critical to focus on the process by which the Town negotiates these types of development deals, and address the public’s opposition to closed-door planning meetings and tax abatement negotiations with private companies. I’ve loved being a part of the Northeastern and College of Engineering community – from my start as a student in 2007 through my current employment in the Center for STEM Education. As a student, I benefited greatly from the hands-on coursework led by truly invested and dynamic faculty members, many of whom continue to provide me with guidance to this day. The summer of 2010 was my most memorable as a student; I was fortunate to have the opportunity to travel with Dan Saulnier and the EWB team to Honduras, after which I joined the late Prof. Bruce Wallin from the Political Science Department on a Dialogue of Civilizations to Japan and Meiji University, and ended the summer in the Netherlands studying sustainable transportation with Prof. Peter Furth at TU Delft. After graduating from the Civil Engineering program, I continued working full time at the Center for STEM Education, supporting K-12 outreach events such as the BPS Science Fair, middle and high school summer programs, and community engagement with individual students and student groups. I have been blessed to work alongside Claire Duggan, Christos Zahopoulos, and many other tremendous colleagues since I first joined the Center for STEM as a camp counselor in 2008. I have been blessed to work alongside Claire Duggan, Christos Zahopoulos, and many other tremendous colleagues since I first joined the Center for STEM as a camp counselor in 2008. After seven rewarding years of involvement with the COE and broader community, it saddens me to announce that I will be resigning from my position effective October 2nd, 2015. I have come to this decision primarily due to my personal aspirations to explore entrepreneurial initiatives. I’ve always had a deep appreciation for civic engagement, and will be pursuing a program to support public participation in legislative and political initiatives during and after the 2016 Presidential Elections. I’d like to take this opportunity to say thank you to everyone who has supported me along this journey.These two words hardly express the gratitude and appreciation I have for the support and guidance you’ve all provided, and I hope to return the months and years ahead. To my colleagues at Northeastern: The COE provides a great pillar of support for K-12 and community engagement, and it is exciting to see the College and University increasingly embrace and support these efforts. I thoroughly believe that all students should be encouraged to engage with and serve the community, and I look forward to hearing about the continued successes of the faculty, staff and students supporting the people of Greater Boston and beyond. At the Center for STEM, we have helped bring thousands of K-12 students to the University for STEM outreach activities – to engage them in hands-on projects with faculty and student groups, bring them to research labs, introduce them to various STEM fields, and get them excited about pursuing higher education in the future. For many of these students, it is their first interactive experience on a college campus. The kids are highly impressionable, and when they visit NU I always hear, without fail, their expression of interest in coming to study at Northeastern in the future. Whether they eventually attend Northeastern or another institution, these programs inspire them to succeed – and it gives Northeastern a great reputation and standing with the community in the process! As I transition out from Northeastern, I ask for your help once more in vocalizing the need for the programs and services which are facilitated by the Center for STEM. Any advocacy that you can provide to leadership in the University or the COE will help build the case for greater investment in and support for Claire, Mary, Nick, Maureen and the rest of the STEM team. I greatly appreciate your help in continuing to support the team and the program efforts. I look forward to my continued interaction with and support for the Northeastern community and the Greater Boston region, and appreciate the many years of education and professional experience that I was afforded here. I’ve had the distinct pleasure of traveling to Japan 4 times over the past 6 years. This video is a compilation of footage taken from the 2014 and 2015 Northeastern Dialogues to Japan and Meiji University. Thank you to all of my friends and colleagues to supported this program, and the partnership between Meiji and Northeastern. Thank you to the late Prof. Bruce Wallin, who gave me the opportunity to participate in this program when I was a student in 2010. I look forward to my return to Japan – the day cannot come soon enough! Japan Dialogue – Tokyo, Nagano, Kyoto and Hiroshima – 2010-2015 from Daniel Sullivan on Vimeo. In Memory of Prof. Bruce Wallin (1948-2011). Words will never be able to express my gratitude. From Oct 10-12, I participated in the 2014 Millennium Campus Conference at Lynn University. The event brought together youth leaders from around the globe to engage in dialogue and networking to build partnerships and advance global development efforts. Participants included Nick Kristof of the NYT, Sakena Yacoobi of the Afghan Institute of Learning, Carrie Hessler-Radelet of the Peace Corps, Mischa Barton and Kristin Davis, Andy Rabens of the US Department of State, and many other distinguished leaders and youth representatives. As part of this event, I prepared and conducted the first-ever Global Youth Survey to highlight the successes and needs of youth-led organizations around the globe. The survey itself can be found here, and the presentation that I delivered on Sunday Oct 12 about the preliminary findings is below! The United States has pioneered shale gas production with great economic benefit, resulting in more efficient and affordable energy, lower greenhouse emissions rates, and increased energy security. In pursuit of cleaner sources of energy to satisfy the demands of the US and the world, shale gas has become a more economical fuel source. With total pollution impacts lower than that of coal and oil, proper shale gas production has the opportunity to provide affordable and efficient sources of electricity and transportation fuel for homes and businesses in the United States and around the world. The United States currently consumes oil, gas and coal resources at a rate higher than almost every nation, and it is well understood that the American standard of energy consumption is well beyond the capacity of the earth to sustain. We will force environmental devastation if we continue to use fossil fuels at the rate we currently burn coal and oil. While natural gas does not provide a long term solution to the world’s dependence on fossil fuels, It offers a significantly more efficient and economically affordable replacement for coal and crude tar oils, and leads America closer to energy independence. It is important that the environmental impacts of shale gas production be fully understood, in addition to the human and animal health risks associated with possible air and water pollution. Removing the existing loopholes and exemptions from disclosure of information about gas development practices are critical in providing transparency to the energy and electricity industry. A cleaner source of energy can reduce our contributions to global climate change, though we must maintain safe production processes to ensure minimal environmental impact. Communities must establish strict environmental guidelines to protect our families and neighbors, and ensure that gas development activities do not bring air, water or ground pollution into our back yards. At safe distances from homes and farms, efficient gas production activities have significantly lower environmental impacts compared with current coal and oil production practices. To wean the United States off its dependence on dirty fossil fuels, we must transition to cleaner sources for electricity generation and transportation fuels. Efficiency in energy production will allow us to reduce our emissions rates, support economic development and equitable access to fuel, and improve energy security for the near and long term. Advances in the production practices of shale gas development have recently made the sandstone economically viable enough to extract gas from. 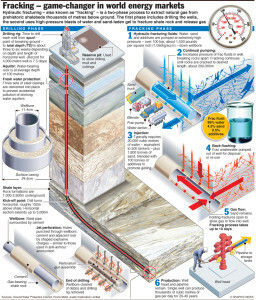 Horizontal drilling practices combined with hydraulic fracturing allow gas to be safely extracted from the abundant reserves across the nation, and the successful production efforts have encouraged countries around the world to explore production of shale gas in order to increase their energy efficiency, domestic security and independence. By keeping our homes, farms, businesses and wildlife away from gas development activities, we can continue to decrease our consumption of dirty coal and oil, and move towards more efficient and sustainable gas resources in the transition to carbon-neutral renewable energies. I was inspired by the movie Chasing Ice to pursue a passion for outdoor time lapses. In this instance, I needed something safe, long term (~1 yr), and able to take very cold conditions. While I love the Canon CHDK setup, there are few outdoor options for consumer purposes. The GoPro can be used with the well-designed Cam-Do outdoor mount, scheduler, and Voltaic batteries for an outdoor timelapse of long duration in near 0o F weather. It is unknown how long the battery life is for a standard lithium GoPro battery in the below-freezing temperatures. A silica packet can be included if humidity is an issue, and a packing of towels or insulation should be placed around the camera, scheduler and battery. When it rains, the risks associated with bicycling increase by magnitudes. Everyone’s vision is impaired, their sound muted, and tensions high. There’s generally more traffic in rainy commutes, and everyone is eager to escape the weather. The combination of dangers and frustrations make biking to work in the rain almost not worth it. It rained this morning. On the way to Northeastern I said a few words to a cyclist in front of me at a red light. “Still beats driving, right?” but he just nodded and started up. Not more than 1000 feet later I saw him traveling around 15 mph at the intersection of Longwood at Kent St., where a car riding in unison failed to see him, and turned into his path through the light. The collision was avoided only because the cyclist perceived the car’s failure to yield and slowed down in anticipation that they might turn, not being able to see their signal. As I was about 100′ behind I both saw the signal and the turn, and was likely the only person who could have yelled out before he noticed. He chased after the car – they drove at a taunting pace away, though I am not sure if they did stop or not. Another 100′ down the street past Kent St at Longwood at Chapel St., 3 Brookline Police were stationed on bicycles. In the rain, they must not have heard his yelling. So I biked over to them, and told them quickly that a car had hooked this guy, and then started driving away. One reached for his mic, but looked around and inquired more, asking me to draw a diagram and picture of the car. But really, they just stood there not knowing what to do, while this cyclist chased after the car to who knows what end. “Whats going on at this intersection?” Longwood at Chapel St – last exit in Brookline before crossing the Muddy River to Boston. So why are there 3 officers at this one intersection. I imagine the rational is a history of crashes and conflicts at this particular intersection. 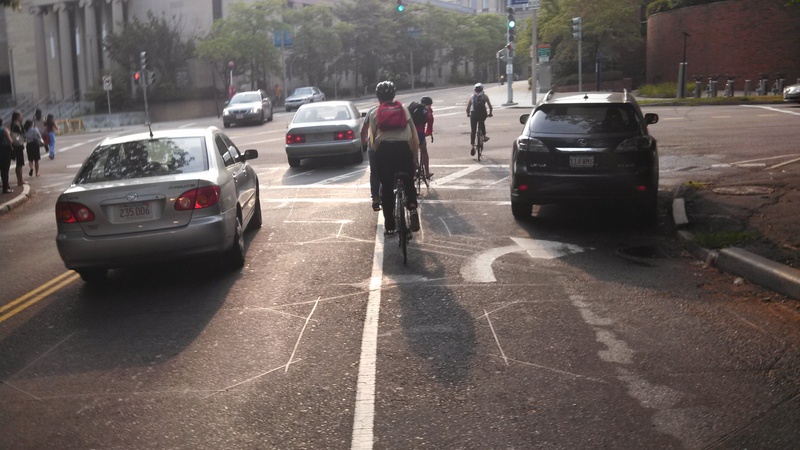 Or, more likely, a history of cyclists running this red light and crossing on a red. For any reason, they were probably told to ‘go stand there for a while’. Hand out a few tickets if you see anything, but hopefully you wont – since you’re out there every day. At the same intersection. This afternoon I took the same route back home. Most of my ride was conflict-free, despite being in heavy traffic. I took the path from Longwood over the Muddy River, to the intersection with Chapel St where the officers were stationed. First I’ll admit, I went on a PED phase which is also the left turn from Riverway to Longwood. As I merged on the right side of the cars, I checked over my shoulder to see if I could move left to avoid a truck turning right onto Chapel. I thought he was turning and had a second, took a peek, looked back, and slammed on the brakes before skidding into the back gate of the Ford (or..whatever). Fairly unphased, I realized something was wrong with my bike, and started to move out of the way.. the guy got out of his truck, confused, asked if I was alright, shook my hand, and left. The guy driving behind me came out and asked me if I was alright after, as did one of the cyclists I rode by as I crossed during the PED phase. Whoops. Anyhow, I fix my bike (minus the front brakes) and continue. About 100′ after I pass Longwood at Kent St, I hear honking and turn to see a car riding in unison with a cyclist. They honked several times in short succession, seemingly wanting to warn the cyclist they were about to turn into him. He kept riding, and they yielded, but I couldn’t tell exactly what happened. So I let him catch up to me and asked, and he said he couldn’t tell what they were trying to do or if they thought they had right of way. As we talked, he told me he’s been in 3 accidents, and told me one where he was hit or merged into by someone one a cell phone – I didn’t learn about the others. Not many people would continue to do something with this type of risk. Eventually you have to think, it’s only a matter of time before I’ll get eaten by a car or truck, too. There are a wide range of attitudes and perspectives around the issue of teachers unions, and the effects these unions have on our children’s learning. As with most political circumstances, a healthy balance of agreement and disagreement are needed in order to fully appreciate and comprehend the various sides to the issue(s) at hand. All too often, impassioned and well-meaning individuals can take a stance that is very definitive, faulting a singular source as the blame for a much larger, systemic issue – such as the case in the US gun ownership argument, for instance. 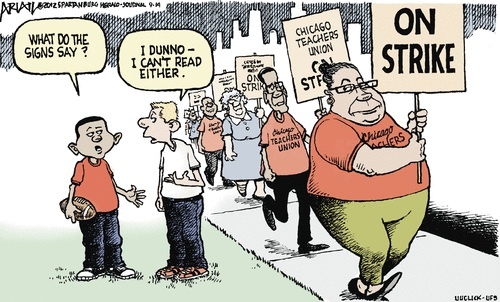 In the case of teachers unions, there are avid supporters and cynics. I do not believe any teacher, administrator, legislator, or other public official would intentionally deteriorate or be a disservice to the educational system. In my view, all efforts to address the issue of failing schools/students and educational woes are made in good faith, but sometimes by individuals or groups without sufficient understanding of a school system and particular case scenarios, and without a fundamental ability to anticipate unexpected consequences of a give action/reform. The additional efforts required with an increasing population of non-native English speakers is exhaustive. Outside of the classroom, teachers must be able to interface with parents/guardians of the children in order to provide the same level of interaction as with traditional students – something which can be more challenging than working with the students themselves. Unreasonable expectations have been set forth on educators to facilitate classes with a mix of English-proficiency students, with the goal to have them come out of the classroom at the same level as their peers. The different models for educating ELL students that we reviewed are an example of how delicate and personal of an issue this is, and just how many ways there are to provide directed services aimed at improving these students’ capacities. There is no one answer for this issue, and these students must be accommodated on a case-by-case basis, where often times the teachers, parents, and administration are the only ones capable of making the best decisions for their children. Special education students present similar challenges for educators as ELL students, in that there are many ways to provide directed services for them, never enough resources or educators/supporters to go around, and a demand for case-by-case support that often times cannot be met by the schools and teachers. Decreases in funding programs and both financial and in-kind support for schools can be both easy and difficult to measure. When there is a dip in funding, less programs are offered to the students, less teachers are employed, and less resources are available. These are easily measurable, quantifiable downturns that lead to very quantitative impacts; higher class sizes, less discretionary funding for classroom resources, less field trips and extracurricular offerings, etc. In some cases, the effects of losing some support programs are less evident; less support staff or community engagement, less professional development opportunities for educators and administration, etc. In any given year, teachers and administrators must balance their resources and support without becoming overly-dependent on any one program, individual, or source of funding – since you never know how long they will truly last. The year-to-year support (financial and service) is so volatile in some schools that it makes it nearly impossible for the school to have sustained growth. I think any program supporting a school and its students should be in place for no less than 5 years, with defined entry and exit strategies and sustainability plans that will leave the school stronger upon completion. The last source of pressure on schools and educators has come gradually, indirectly through the downturn of other services often provided outside of the schools; health services, counseling, adult education programs/support, and other non-traditional services that are more and more often being demanded at schools. While these sources do not exactly address the issue of teachers unions, I believe they are an important predecessor in outlining how to best address the educational challenges that we currently face across the nation. Teacher’s unions are often blamed for the failing student populations, lack of discernible improvements made over the course of a semester or year, and for just about everything else that a teacher has a hand in doing. While I would agree there are many faults with the unions in general, it is clear that the systemic social problems are at the root of the overall failings in the educational system. No teacher, unionized or not, paid $100,000 or $40,000, can independently solve the overarching failures of the communities and national society that currently exists. In order to stem the decline of the US school system, the first issue to address is a national pre-K program, and support/services to the most disenfranchised new parents and families in the urban and rural areas across the US. If a child is not afforded the growth and nurturing necessary in the first three years of their lives, they will be forever at a disadvantage and their ability to learn and grow will be forever stifled. A child entering any grade below the capacity of their peers will not only suffer personal determinant, but also carries the risk of bringing his or her peers down with them – through no fault of their own, I might add, but simply through natural tendencies (nobody wants to be alone, after all). There also exists a strong inclination for ‘top-down’ solutions; national and state-wide frameworks, district-directed curriculum plans, state-wide evaluation metrics, etc. As Wagner has expressed, there seems to be little confidence and mobility for educators on the bottom level to ‘innovate’ in the classroom. Any teacher can know when a lesson is going badly, and when students do not develop an understanding of the concepts. It takes a special individual, and often times a team of individuals, to take a lesson apart and figure out just how to properly scaffold, integrate cross-curriculum concepts, and provide self-learning opportunities for students to truly engage in and develop a deep understanding of the content. But without any discretionary funding to buy supplies, show videos, bring in guests, and take field trips, the teachers are stifled and complacent. They do the lessons, they go home, and they don’t reflect or build off of their successes and failures. Evaluations: If you ask a class if their teacher is good, you’ll likely get a pretty reasonably-accurate assessment. If you ask a parent how much contact the teacher has with them, how much homework their student gets and of what level of difficulty, and if they believe the teacher is actively engaged in their individual child’s growth, you will likely get a pretty reasonably-accurate assessment. If you ask the teacher’s peers and supervisors how they think the teacher performs, you can likely get a pretty-reasonable assessment. If you examine directed* test scores for students at the beginning and end of a semester, you can likely get a good understanding of how the students content knowledge has improved over the course of the year. As Wagner noted, there must be a higher level of support and interaction between teachers and the administration. 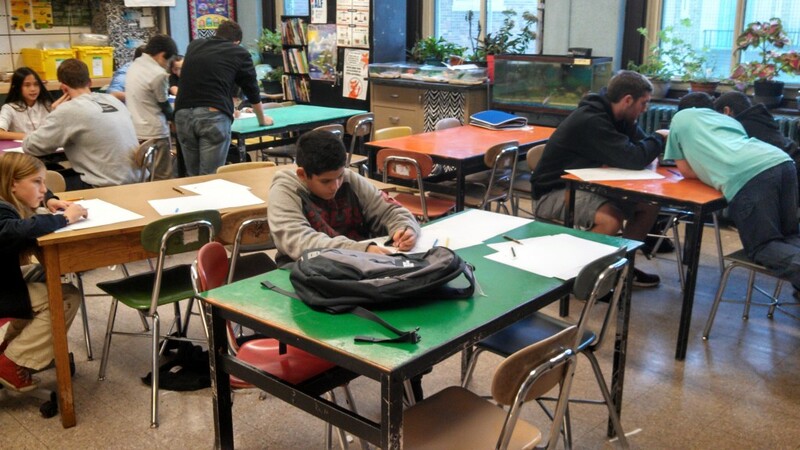 Principals and specialists must sit in on classes as frequently as possible. Other teachers must share lesson plans, resources, and advice, and must also observe and support each-other. At the University level, this collaboration is not only accepted by demanded. Faculty do not usually sit-in on others’ classes, however they are very actively engaged in supporting each-other’s lesson planning, curriculum development, and supporting activities – both between and across colleges/disciplines. Such collaboration must be nurtured and supported at the K-12 level. There are many individuals and schools that already excel in this support and feedback system, however there must be both a bottom-up and top-down drive to initiate and structure such teamwork. Videotaping classes, group feedback sessions, structured professional development opportunities, and open-discussions are, in my opinion, a must for each teacher and school – both internally between disciplines and externally among all teachers at the school and other schools in the district. So many K-12 educators operate strictly within their own individual silo, too engrained in their own work to realize the opportunities for support right across the hall. Often times, teachers hardly will even speak with one-another, even those teaching the same content areas. On the subject of seniority, teacher performance, and the tenure-track that secures teachers a strong foothold in their job; such a system did once exist in the US, though on not such a formal basis. For-profit companies would (and still do) favor seniority, performance, and dedication. But when a better-suited employee comes around for a job, the company is generally going to hire the most-capable candidate, and will fire the worst-performing or most dispensable employee. In the public education system, there are teachers who are in the school not because they love to teach, but because it became their job and now they do it because it is ‘all they know’. We have thousands of students that graduate college each year that have a great desire to be actively-engaged teachers. They are (generally) well-educated, have the current technological comprehension/abilities, and are aware of trends, child expectations and changing social settings that some of the more senior educators may not be as in-touch with. This is not to say they are or would be better teachers, but just that they exist and have a strong desire to be in the classroom. Some teachers quite frankly do not like teaching, have grown out of the role, but continue to teach since there is little mobility to transfer to another career path or role. These teachers may still perform well, but will never go above and beyond the call of duty. They don’t show up for the extracurricular school offerings, the special events, or the student’s performances and the students are subtly aware of this. The administration is also aware of this disinterest. While I agree with Diane Ravitch that we “don’t have a problem with ‘bad teachers’”, I think there are still many teachers who should find other gainful employment, retire, or play a role of ‘support’ for the younger generation of educators eager to embark on a career in the classroom. A school principal and staff are well aware of who the teachers are that are only ‘in it for the job’, and those which the school could stand to lay-off. While the teacher’s union supports working rights of educators, the unions’ ultimate missions are for improving student education. In the coming years and decades, the unions must actively promote health conversation and collaboration between members, between teachers and school administrators, and between teachers and families. There are only a few teachers that should be fired, and it is ultimately a bigger battle to fire them then to let them ‘run their course’. The bigger, more sustained effort should be focused on cultivating a sustainable, collaborative and interactive community within each school and each teacher/administrator. I had an idea that teachers should be paid a rate based on the difficulty-level of the school within the district; a low-performing school would pay an incoming teacher more than they would receive if they signed at a higher-performing school, with the expectation that the higher salary would require longer working-hours, increased support/services for their students, and additional PD and team meetings/collaboration. Teacher pay is an incredibly difficult issue; should it be based on subject content taught, years of experience, content knowledge (STEM, languages, etc), location, student population, etc. There is no singular answer to this issue, and it must be addressed on a district-by-district basis. My feeling is that teachers should be compensated more for working in more-challenging environments, however there should also be incentives for improving student performance and enthusiasm for both low and high-performing schools. Perhaps merit-based pay can be an effective tool for divvying up 10 or 20% of the salary, in order to integrate student/parent/peer feedback. At the end of the day, the teachers unions are not going anywhere. It is important that districts and administrators feel comfortable working with their teachers, negotiating contracts, defining expectations/roles/responsibilities, and outlining plans for continual improvement, collaboration, and professional development. For the most part, teachers are in the classroom because that’s what they want to be doing, and they see themselves as promoting social good and supporting their community – they want to help. It is crucial that the administration, legislatures, and unions define how to improve connectivity between teachers, support structures for enhanced PD, and models for evaluation metrics. I ask myself this question at times, and it becomes increasingly difficult to answer. It is the single most important question a teacher can ask their students. It should be a question asked pointedly, every so often, when you feel the kids are open to sharing their dreams. And when you get a student with a consistently insubstantial answer, then it is apparent there is some underlying issue – a lack of motivation and interest, a feeling of ineptitude and self-sorrow, or any number of things. The passion and curiosity exhibited by the 3rd grade student should not be lost in middle or high school, but rather supported and directed. A third grade student might say “an astronaut” one month, and “a zoo keeper” the next, and this range of answers is both healthy and necessary. And as a student progresses through the end of high school, you hope to see the direction become somewhat more identified, as they gain new experiences into different fields of study. When our schools and teachers are being insufficiently supported, this lack of motivation takes hold on more and more students as their educators are unable to provide the academic stimulation that kids so crucially need from the day they are born to the time they graduate from high school, and beyond. Teachers and educators at some point in their lives asked themselves this question, and they chose to embody the driving force of the nation and the definition of our future: the students and their dreams.